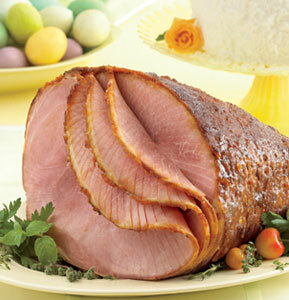 Easter Ham – How many calories? Ham is the traditional Easter main course, unless you’re going to an Easter buffet with your family and have miles of different foods to choose from. So how many calories are in that ham, or how much can you eat without ruining your calorie count on Easter? And what about the salt? Ham and salt go together because salt is used to cure and preserve ham. Here are some differing estimates that may help you with that ham dinner. Myfitnesspal.com puts a three-ounce serving of honey baked ham, spiral cut, at a very manageable 150 calories. Three ounces is a small amount, less than a quarter of a pound, however. The quarter pounder works for McDonald’s. Maybe it can work for you, too. But then the salt kicks in. That three-ounce portion has 960 mg of salt, or 320 mg an ounce. We need around 2000 milligrams a day and medical experts say that many of us should cut it to 1500. Another site good on calorie matters, SparkRecipes.com, puts 5.33 ounces of ham, presumably made without the honey this time, at 337 calories but with a sodium level of 2,273.4 mg. Experts recommend that adults consume below 1500 mg of salt per day. Maybe the idea is that Easter only comes around once a year. Enjoy some ham and be done with it. Just don’t overdo it, particularly in view of the sodium content. I think the old saw, “All things in moderation” comes into play here. You can enjoy some ham on Easter as long as you don’t make a pig of yourself. …Or exercise enough to sweat a lot… then the salt won’t hurt a bit. Nor will the second helping of ham!